On April 7th, we announced a new version of Gmail for mobile for iPhone and Android-powered devices. Among the improvements was a complete redesign of the web application's underlying code which allows us to more rapidly develop and release new features that users have been asking for, as explained in our first post. We'd like to introduce The Iterative Webapp, a series where we will continue to release features for Gmail for mobile. Today: Labels. --Shyam Sheth, Product Manager, Google Mobile. You asked for it, and we listened. 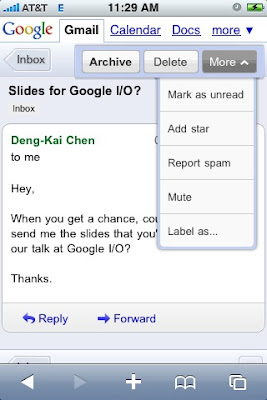 We've added labels to Gmail for mobile on Android-powered devices and the iPhone. Labels in Gmail allow you to use color-coded tags to manage your inbox. To label an email, select a message then tap 'Label as..." from the drop-down menu on the Floaty Bar. In the pop-up menu, select the label(s) you would like to use and tap 'Apply'. Please note, you can add and remove existing labels to your emails in Gmail for mobile, but labels can only be created, renamed and deleted in the desktop version. To label your emails on the go, point your mobile browser to gmail.com on your iPhone or Android-powered device. To make it easy to check your Gmail, try creating a home screen link. The new Gmail for mobile supports iPhone/iPod Touch OS 2.2.1 or above, as well as Android-powered devices, and is available for US English only. awesome! how about the ability to add emails to Tasks? sl4m, that was gonna be my question too. Gmail for BlackBerry isn't very pretty. I wish I could attach files to my e-mail. Sure, there's BlackBerry e-mail but I would rather use a more featured e-mail program for Spam reporting and so on. Great improvement. Unfortunately this upgrade also created a problem in that images are not displayed within messages even if you have previously said to always display messages from the sender. When i go onto the browser there is no option to label as under more. I have a T-Mobile G1 running the 1.5 update but it still does not seem to work. I was thinking this through and it may very well be a limitation in the Blackberry Browser. I believe Android's default browser uses webkit as does iPhone's browser. I believe webkit offers features not found in Blackberry Browser which could be the reason why they are adding these cool features. Yet again, we UK users are left miles behind. We STILL cannot access the new Gmail for Mobile, which is supposed to be available to Android handsets and iPhone / iPod touch. It has been months since the new version was made available to the US. You keep adding features...when are you going to roll it out to other languages? The only way a UK user can access the new Gmail is if we set our language to "English (US)" and then we have to put up with incorrect spelling and improper date formats. Blackberry support is important, especially since Verizon users cannot choose to use an Android or iPhone. It seems like you still care about Blackberry, with the new BES integration (except nobody uses BES, and only 1-way calendar sync? That's not attractive...), but Blackberry is definitely miles behind in support. We still don't even have the cool Google App launcher with voice search, and that's old news. please include gmail & its features in Tmobile. While I love the newly updated format and additional feature like labels am wondering when users will be able to sync Google Tasks to their device for use while offline? I can sync mail, contacts, and calendar using Google Sync and the native functions built into the iPhone/iPod Touch, but tasks remain a purely online utility. Are there future plans for this feature? Need some Blackberry (Storm) love here Google! The native Gmail Blackberry App is seriously lacking - does not even display HTML emails! Chalk up another BB user here. Give us some love google! Gee - all this pretty stuff. I can't understand how you have been releasing updates to the new mobile interface yet you have not yet fixed the major bug related to the fact that images simply do not render in an email. Don't you kind of think that is important? Until you fix it, this interface is basically useless, and I continue to use the iPhone's native app. Outstanding. Labels is one of the major reasons I use gmail. So glad it is now in the mobile app. What about BlackBerry (Bold) support? Or a timeline of support? Please! Thanks. BlackBerry update please!! (Storm user) THANK YOU!